Food instability is a scary thing for many people. A few years ago we heard about the Empty Bowls project…a beautiful way to incorporate art and helping others. We searched for an event nearby and by chance found one in the Wyoming Valley area. This led us to meeting Jean Adams, Ceramics Instructor at Wilkes University, who organized the Wyoming Valley Empty Bowls. We signed up for a pottery class with Jean to learn how to make the bowls, but soon discovered that we were not proficient enough to produce enough bowls ourselves to host an Empty Bowls event in our area. Jean was gracious enough to offer any remaining bowls from their previous event for our Empty Bowls fundraisers in the Greater Hazleton area. We would like to sincerely thank Jean Adams of Wilkes University and many other potters from the Wyoming Valley for making the Empty Bowls 2013 and 2014 events possible. We are so grateful to Hazleton Area High School Art/Culinary Art teachers and students for all their help in order for Empty Bowls Greater Hazleton to continue in 2015. 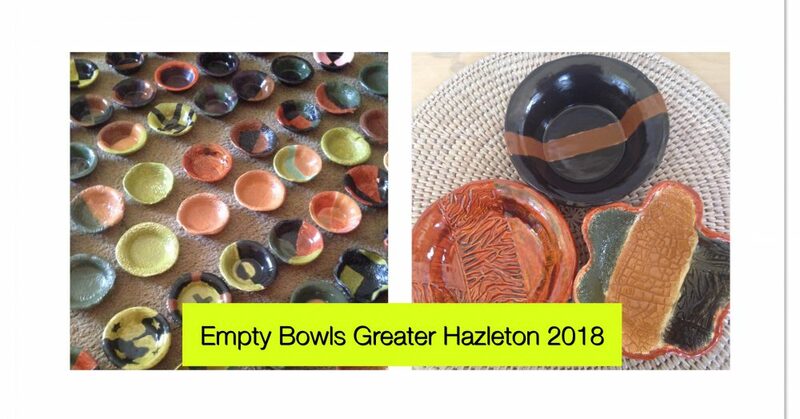 Once again, many thanks to Hazleton Area High School Art/Culinary Art teachers and students for all their help in order for Empty Bowls Greater Hazleton to continue in 2016. The art students made the beautiful bowls and the culinary art students made the Garden Vegetable Soup. Thank you also to Dee Dee Maylath/Fireside Lounge for making and donating the Chicken Pastine Soup. Also, four students from the Art and Humanities Academy Chorus entertained at the event with their beautiful singing. Many thanks to Hazleton Area High School Art/Culinary Art teachers and students for all their help in order for Empty Bowls Greater Hazleton to continue in 2017. The art students made the beautiful bowls and the culinary art students made the Garden Vegetable Soup. Thank you also to Dee Dee Maylath/Fireside Lounge for making and donating the Chicken Pastine Soup and hosting the sold out event. Advanced Tickets Only – Please call Liz Hoegg at 570-956-4403.